Tiled is an open source freeware map editor for placing objects (e.g. polygons, splines or images) in a two dimensional space. We use Tiled for placing our in-game objects on our maps of Railway Empire – and so you can, too. 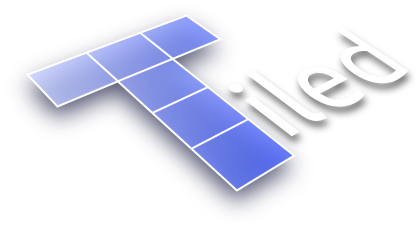 If you want to learn more about Tiled in general, we would recommend to have a look at the documentation and forums found under the link mentioned above. A *.tmx file basically contains information about cities and productions (plus some minor this that are not that important right now). It can be edited with Tiled, but if you have a closer look at the file within a text editor, you will notice that it is rather much the same as a *.xml file. What can I find in those files and how does it work? This is for placement of herds of bison and golden eagles. The number of layers you will find here can vary and there is no required minimum for them (a maximum number has not been tested so far). The naming convention is “/assets/critter_bison0.asset” for creating a herd of bison and “/assets/critter_goldeneagle0.asset” for creating a golden eagle. In addition, it is important to define the type which can be found within the Objects window of Tiled. For bison it should be “land” and for an eagle it should be “bird”. The representation of the bison is a circle with 500 in diameter or 300 for the eagle. As you can probably imagine, those Objectlayers are representing the cities. The actual city name must be composed of small caps only without any special characters and an underline (the “_” sign; without quotation marks) instead of a space – just like the sub-headline of this paragraph. (0, 0; top left corner of the grid that can be toggled on and off with CTRL+G within Tiled) that should be located exactly where you want the city’s centre to be. In the game, the city will grow and expand around that point. production1 This defines the first production in the city. factory is available in the corresponding era. production2/production3 This defines the second and third production in the city. Note: The User defined properties are not used by the game itself, but they can be a great help if you want to minimise mistakes while carrying the data over to Tome. This Objectlayer contains layers representing the connections between two cities. Each of those layers contains a line (straight A to B line) which starts on one city’s centre and leads directly to another city’s centre. Those connections will enable the two cities to trade the commodities produced there. The naming convention of each layer is pretty similar to cities: [city_name]_[city_name] (The name must be composed of small caps only without any special characters and a “_” sign instead of each space (even between two city’s names or within one city name). Example for Los Angeles to San Diego would be named “los_angeles_san_diego”. Note: It is not necessary, but recommendable to distribute even those productions which are not needed in your desired era, because it will enable you to switch the era later. Each of those Objectlayers contains several things. For each production you want to create, you will need at least two things: the production and the fields/pits – connections are optional. [commodity][n]_ [field/pit][m] With [n] in correspondence to pro_grain[n] (for visual appearance it is recommended to keep those fields/pits close to the production). [m] is an indicator for the consecutive numbering starting with 1 for the corresponding pro_[commodity][n]. The reason why I mentioned “pits” before, is that the productions of coal, clay, concrete and iron need to be named (e.g.) coal[n]_pit[m] (as opposed to grain[n]_field[m] for example) as those products need to have pits instead of fields. [commodity][n]_[city_name] Not necessary as not every production needs to be connected to a city, but if you chose to do so the naming convention is pretty much the same as explained for cities. With [n] correspondence to pro_[commodity][n]. This layer must contain a connection between a city’s centre and a production’s centre similar to those in "citylinks" ("Insert Polyline [L]" tool). If you want to use those, you should make sure that you don’t forget to adjust the consecutive numbering. Contains a layer with a triangular object (pointing towards the camera) that represents the position of the turntable (the scene where you can buy trains). A template can be found here: other_templates.tmx (background image). It is possible to move it, but it is not recommended as the area around the initial position will be blocked and cannot be edited. State borders and names (you might encounter slight differences comparing to the real world as certain things had to be adjusted to reflect a good scale for a game) and sometimes the flag(s) of adjacent countries. With those colours in mind, differences in the colour shade can be noted and those are representing the different height (the brighter, the higher). screenshot Contains an image which shows you a screenshot of the terrain (without clouds and their shadows). All of those Imagelayers have no impact on the game. However, they probably come in handy while creating or editing any of the existing maps. Within the Properties window of Tiled, you can adjust things like transparency in order to create a workflow suitable to you. How to create a map in an at least somehow balanced state? Well, besides from following the guidelines mentioned above, there are several things you should keep in mind. However, if you like to challenge yourself, you can feel free to intentionally edit some things in a slightly unbalanced way. First of all, you should know that a city’s level will not change as long as there is no station in that city. After a station has been added to the city, it will enable it to grow or decline. This will depend on the variety and quantity of commodities arriving in that city. If you already have played the game, you will know that with an increasing number of inhabitants, a demand on a wider variety of commodities will be created. That in mind will allow you to carefully adjust a city’s initial productions, initial city links and initial connections to rural businesses. city_city_range This is the range in which cities should be connected. A connection is only working when instructions under Create/edit in-game assets are followed. Radius: 2,5km (a level in Tiled has a size of 10000m²). G0-2-3_G1-2-3_G2-1 Within this range there should be 2 or 3 commodities of “Group 0”, 2 or 3 commodities of “Group 1” and one of “Group 2” (note: if a city is connected directly to another city, only the produced goods will be exchanged as long there is a demand – but you can’t send them further to yet another city). Radius: 2km (a level in Tiled has a size of 10000m²). G0-rest_G1-rest_G2-1 Within this range there should be all “Group 0” and “Group 1” commodities that are not distributed within G0-2-3_G1-2-3_G2-1 plus one commodity of “Group 2”. Radius: 4km (a level in Tiled has a size of 10000m²).